This document is an HTML export of the original technical documentation for Legend of the Greasepole. It was generated using an older version of Microsoft Word. Click here to download an Adobe Postscript .PDF version. Adobe did a better job of preserving the formatting of the original document. The contents of this page were written by Robert Burke, Project Manager and Lead Programmer of the Legend of the Greasepole project, and the page was posted on November 13th, 1998. He can be contacted at polegame@engsoc.queensu.ca. Please also see the Zambesi page for information about the Neural Network extension to the Frosh Artificial Intelligence. The LegendWeb, a multimedia history of the Greasepole with an anthology of Queens engineering traditions. The Pole Game showcases IntelliFrosh, an engine designed to facilitate goal-driven, behavior-based groupwork among synthetic characters. The eighty-five frosh characters in the game learn to work as a team to form a human pyramid, climb the greasepole and remove a Scottish tam from its top. The player can employ more than a dozen humorous methods to stall the frosh and keep them from this goal for as long as possible. The IntelliFrosh engine incorporates the five features that Dr Bruce Blumberg of the MIT Media Lab identifies as fundamental to a system for generating synthetic characters: relevance, persistence & coherence, adaptation, intentionality, and integration of external control. IntelliFrosh also provides the 85 autonomous characters interacting in The Pole Games world with the capacity to learn and teach new methods for achieving complicated goals. The Legend of the Greasepoles development spanned a period of two years and involved the work of over 50 members of the Queens student community. Robert Burke, Queens University Math and Engineering Class of 99, acted as Project Manager, Lead Programmer, and Editor-in-Chief of the LegendWeb. He designed and implemented the IntelliFrosh system in C++. Craig Calvert, formerly a Queens University Mechanical Engineering student, acted as Artistic Director during the second year of the project. He designed and rendered the majority of the artwork that appears in The Pole Game. 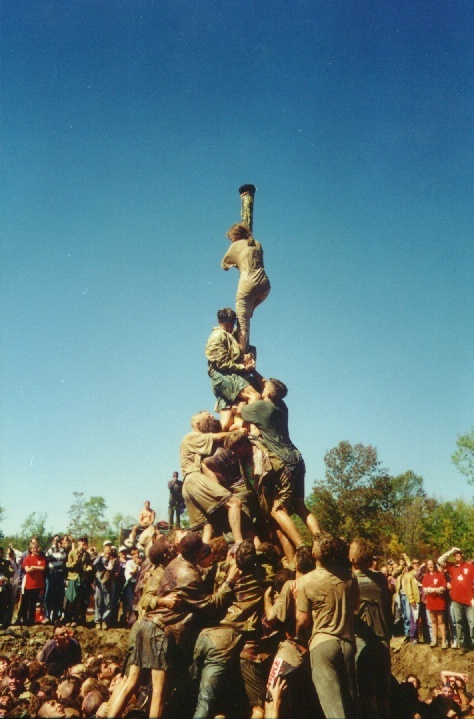 Figure 1: One frosh leaps from the human pyramid, while another yanks at the tam on top of the greasepole in this screenshot from The Pole Game. Functional describes the contents of the Legend of the Greasepole CD. Technical describes the IntelliFrosh engine that powers the artificial intelligence of The Pole Game. IntelliFrosh governs the behavior of the frosh (first-year students), the crowd and all other agents in the game. This section also describes several significant technical aspects of The Pole Games development. Personal describes the role that project management played in the successful completion of Legend of the Greasepole. Terms in this document that have been borrowed from the local Queens University lingo are explained the first time they are used, and summarized in a glossary at the end of the document. On Canada Day, 1996, I sat with a group of Queens Engineers on Parliament Hill in Ottawa, Ontario. I had been thinking for some time about how futile all previous attempts to "capture" the spirit of the Greasepole had been. Perhaps the most successful  Pillar of Wisdom, a short film about the event  conveyed the danger involved in the event, but neglected to comment on the team-building aspects of the climb. I wondered if the spirit, the energy, the team building and the excellence that embody a modern Greasepole event could be captured with an interactive experience. 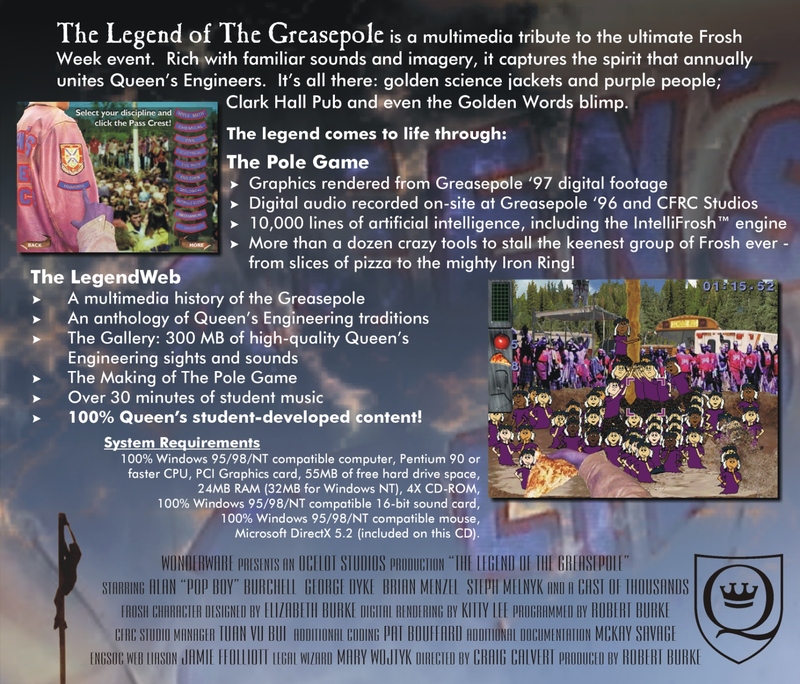 Two Greasepoles, 10,000 lines of code and 500 megabytes later, and with the assistance of over 50 enthusiastic friends, The Legend of the Greasepole was ready for its official release on the big screen at Clark Hall Pub, the watering hole of choice for Queens engineers. Just like at the real pit, the game's frosh only succeed when they learn to work as a team, taking advice from upper year students like Al "Pop Boy" Burchell, a local legend who dives into the pit to help them out. And just like real life, the game tells the story of the inevitable victory of the frosh over the Pole. Included on each of the 1000 CDs we burned is The LegendWeb, over 500 megabytes of multimedia that flesh out our presentation of the greasepole experience. 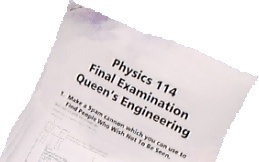 Within the LegendWeb lies some explanation of why Queen's Engineers are known as the most spirited people in the world. It includes information about the academic programs at Queens, the history of the Greasepole, and the making of The Pole Game. Figure 4: Greasepole 1999. The author is in there somewhere. Certainly the best summary of The Legend of the Greasepole is found on the back of the CDs jewel case. Figure 5: Legend of the Greasepole v1.14 tray card. The Pole Game begins as 85 artificially intelligent frosh are tossed into the pit through a roaring crowd. You view the action through the eyes of a Frec (upper-year student) standing on the bank of the pit. The premise is that you and some of your co-Frecs have noticed that the frosh this year are particularly keen. Its likely theyll climb the pole in record time, and not learn the teamwork theyll need to survive their upcoming Applied Science education. You have to stall the frosh for as long as possible as they attempt to climb the Greasepole. As the game progresses, the frosh will learn new tricks, become more resilient to your attempts to stall them, and genuinely learn to work together. Should they have problems, they will be assisted by Alan "Pop Boy" Burchell, an upper-year student who will jump into the pit and accelerate their learning process. Click the left mouse button to toss whatevers in your hands towards the pulsing crosshairs. If you are holding an apple, hold down the button to wind up. A power bar at the upper-left of the screen will indicate your wind-up strength. Click on the firehose if it is offered. A power bar at the upper-left of the screen will indicate the water remaining in the truck. Figure 6: Player unleashing the power of the mighty Iron Ring. There are over a dozen ways to stall the frosh, the details of which are not revealed anywhere on the Legend of the Greasepole CD. Cryptic suggestions for how the weapons might be used are found on the inside of the booklet that comes with the CD. The crowd cheers and responds to everything going on in the game. They are powered by a set of IntelliFrosh behaviors similar to but less complex than those employed by the frosh (see Section 3.2.1 for more information). Legends  The traditions and history of Queens Applied Science, co-authored with McKay Savage, Queens Applied Science 99. Gallery  The images and sounds of Queens Applied Science program. Hundreds of megabytes of stock footage recorded for the game were put to use here. Visions and Betas  A look at how The Pole Game and The Legend of the Greasepole CD were designed and implemented. Also includes information about the IntelliFrosh engine. Academics  Information about the Applied Science programs offered by Queens University. Outlook  A forum for organizations like Queens Project on International Development (QPID) and the Conference on Industry and Resources (CIRQUE+) to showcase their recent activities. Community  A look at how Applied Science students give back to the community, from Science Quest (a summer camp for primary school students run out of Queens) to the Queens Project on International Development. Traditions  From Iron Rings to Purpled Jackets, a look at the roots of the Applied Science program. If the glossary of this document missed something, or you want to know more about the strange spectacle of the Greasepole, this section is sure to answer your questions. Society  A description of the inner workings of the Engineering Society. Pole Game Documentation  A fun and colorful introduction to The Pole Game. Includes a description of how to play, an explanation of some of the traditions seen in the game, and the credits. Not nearly as explicit as this document. Contacting Us How to get in touch with the developers of Legend of the Greasepole. IntelliFrosh is the behavior-Based Artificial Intelligence engine developed by Robert Burke that governs the behavior of the frosh and other sprites in the game. The actions of the frosh character are governed by 31 behaviors that encompass over 5,000 lines of code. Although the details of these behaviors have changed over the course of the project, the core of the artificial intelligence has changed very little since its inception in the winter of 1996. After working on IntelliFrosh for a year, Robert Burke had a chance to take notes in September of 1997 while watching Science 01 climb their Greasepole. Sample pages of these notes  mud and lanolin stains included  are found in the LegendWeb. He used these observations to improve IntelliFroshs simulation of the transition from chaos to order at the greasepit. Each of the 85 frosh thinks for his or herself 24 times a second, and there is no "overmind" that controls the horde. They base their decisions on the interaction of over 15 internal characteristics that describe their motivations, and their knowledge of the game world. Watch the frosh the next time you play the game. Their first few attempts to climb the pole will end in dismal failure, regardless of how slack the player is in trying to stop them. Each time the human pyramid topples, groups of frosh will stop to think and regroup. Notice how each attempt brings them a little closer to their goal as they exhibit more cohesive teamwork. The frosh behaviors are best understood as arranged in the four-tiered system of Figure 7 (below). Each behavior the frosh exhibit consists of an "initialization" function and an "action" function. Each instance of the frosh sprite class contains a pointer to the function serving as the current behavior for that sprite. The first tier of behaviors, numbered 1 through 3, manages frosh under the influence of gravity. The frosh fall with little or no control over their actions. 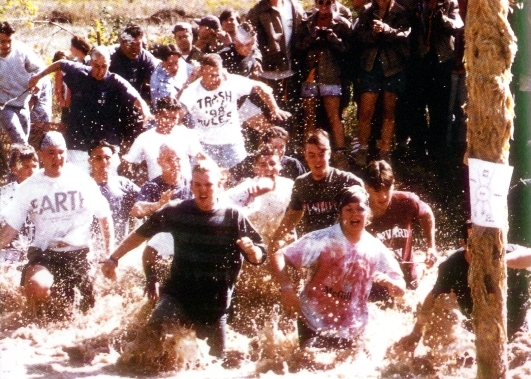 The second tier  behaviors 4 through 7  manages frosh in the greasepit water. Behavior 4 is a sort of "hub" for the artificial intelligence at this tier. A frosh may make a decision based on internal characteristics and their perceived state of the game world to transfer between behavior 4 and behaviors 5, 6 and 7. A frosh exhibiting behavior 7 may choose to exhibit behavior 9 and climb out of the water as a function of their ambition, level of excitement, and knowledge of weight ratios. These characteristics all vary as the game progresses. For example, one way in which the artificial frosh mimic their human counterparts is that they start out keen to climb up the human pyramid. Just about everyone wants to be a hero, and the resulting human pyramid becomes top-heavy. As the game progresses, the frosh learn to exercise caution before climbing up. The third tier  behaviors 9 through 14  manages frosh dealing with the upper levels of the human pyramid. At this point they are being influenced by weight on their shoulders, and they apply weight on the shoulders of those beneath them. A significant amount of the learning in the frosh pertains to how they handle situations encountered at this tier in the behavioral structure. Frosh need to know when to stay put and when to climb up. They need to know if they should beckon other frosh up, jump down to reduce the weight of the pyramid, or balance the weight across the level they are on. They need to know not to accept beer and pizza if its tossed to them, and they need to avoid putting too much weight on the shoulders of any of their compatriots below. The fourth tier of behaviors manages the various incarnations of behavior 16  tugging on the tam. The tam loosens as frosh yank on it in an attempt to get the nails out. A strong tug has a greater loosening effect but also results in a greater probability that the frosh will slip. Chewing at the tam can expedite the process but can also cause a frosh to slip. Figure 7: Groups of behaviors available to the frosh character, arranged in four tiers. The following is a complete list of the behaviors frosh are able to exhibit. Unused behaviors are a result of modifications made to the behavior list during development. Each frosh keeps track of eight integer-based and six Boolean internal characteristics. These range from their ability to sustain weight on their shoulders, to their thoughtfulness when approaching a climbing decision. The following listing of integer-based internal characteristics for the frosh provides some insight into the metrics on which they base behavioral decisions. Typically, each of these characteristics is adjusted multiple times a second for every frosh. attrPersonality Froshs personality (goofy, heavyweight, hoister, climber); adjusts their propensity to perform various actions. attrEthnicity Static throughout game. Allows for different skin tones. Similarly, these are the Boolean-based internal characteristics for the frosh. Several of these are functions of integer-based internal characteristics that are stored in Boolean format to expedite calculations. attrExcited Is the frosh rowdy enough to be running with his or her tongue out? attrWeightOnShoulders Is there a hurtful amount of weight on this froshs shoulders? attrThirsty Is this frosh thirsty enough to even consider running for a mug of beer? attrHungry Is this frosh hungry enough to even consider running for a slice of pizza? In addition, there are a number of "global" properties that affect all of the frosh. Although this was not part of the original plan, Robert elected to include these properties after studying non-artificial frosh climbing the pole. The influence of group psychology at the greasepit is undeniable. This is modeled with IntelliFrosh as a morale metric that adjusts the other internal characteristics of the frosh. 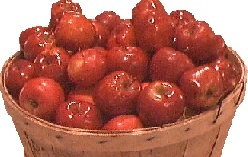 A frosh that is being beamed with apples is going to suffer from a temporary reduction in strength; however, his or her strength will then rise to represent an increased resilience and ability to withstand attack. 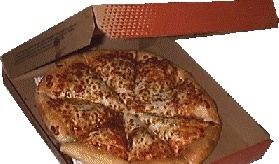 A frosh that is fed pizza will no longer be hungry. Frosh enjoy splashing ArtScis, but the thrill grows old fast. A high intelligence level or a high motivation level can negate the allure of an ArtSci in the pit. Tossing the 114 Exam at the frosh makes them scatter, but their intelligence goes up a notch as they learn from it (by osmosis). The frosh also benefit from eight different "boosters" that represent knowledge of advanced pole-climbing techniques. These techniques are based on the real climbing methods employed by the frosh at Greasepole 97. Here is an example of a moment at which a critical decision needs to be made: What should a frosh do when on an upper level of the pyramid with only one frosh above them and a number of individuals beside them? Climb up? Hold fast? Jump off and reduce the overall weight of the pyramid? Beckon others up? It became clear as development progressed that these sorts of decisions were critical to the evolution of a "teamwork" model for the frosh. The graph to the right (with "time" on the x-axis and "value of booster" on the y-axis) shows how the different characteristics periodically improve. (This image is of a rough sketch made while developing the code.) The introduction of Pop Boy into the pit (at the 6th time unit on this graph) triggers an increase in understanding that provides the frosh a much better sense of how to distribute weight throughout the pyramid structure. Alan "Pop Boy" Burchell provides a boost each time he hollers at the frosh. His line, "Build up the base, frosh; you need a strong base or it all falls down," for example, teaches them the importance of balancing weight between the various levels of the pyramid. Heightened ability to resist the temptation to drink beer or eat pizza. Ability to make decision to jump from a high level of the pyramid to help reduce weight. Better understanding of when to be keen and climb up, and when to stay put and support people above. Ability to support additional weight on shoulders (coincides with increased strength values). Ability to beckon other frosh up (passing them a "message" encouraging them to do so). Near the end of IntelliFroshs development, its author came in contact with Dr Bruce Blumbergs thesis Old Tricks, New Dogs: Ethology and Interactive Creatures. Dr Blumberg, who leads the Synthetic Characters group at MITs Media Lab, asserts in his thesis that ethology and classical animation are ideal sources of inspiration for interactive creatures. IntelliFrosh incorporates the five features that Dr Blumberg identifies as fundamental to producing authentic synthetic characters: relevance, persistence & coherence, adaptation, intentionality, and integration of external control. Relevance is fundamental to the behavior-based system: the frosh weigh over a half-dozen internal variables each time they make a call as to how to appropriately proceed. Some are more "traditional" (hunger, curiosity) while others are more Greasepole-oriented (resilience, ability to sustain weight, fear of heights). Persistence and coherence are achieved through altering the frosh mindset as the game progresses  as the Frosh grow tired and less interested in distractions, their ability to persist towards the long-term climbing goal increases. As a result, the system is able to reflect their increasing ability to exhibit persistence. Coherence is achieved through the use of a number of techniques, including limiting the times a change in behavior can occur. The game engine is kept running smoothly by staggering which frosh are making computationally intensive decisions during any AI cycle. Despite their two-dimensional rendering, having over 100 unique graphics associated with the character allowed for considerable display of motivational state and intentionality. The frosh indicate to each other (and hence, the player) what they believe to be an "ideal human pyramid." They beckon their friends up, and look frustrated when too many people weigh down their shoulders. Learning and adaptation occur continually. The frosh continue to learn from experience and from their friends. These effects are discussed above. Finally, integration of external control is what makes the game a game. The players role is to provide the frosh with alternatives to their primary goal of retrieving the tam from atop the pole. Whether the player is tossing a slice of pizza (good for eating) or an Arts student (good for splashing), the whole point is to play on the internal variables of the frosh and keep them distracted and having fun. What is unique about this system is the veritable mob of artificially intelligent characters interacting in the virtual world. There are 85 frosh in version 1.14 of Legend  more than the author thought the computer would be able to handle at 23 Hz (but less than the 570 Frosh typically tossed into the Pit each September!). The other animated sprites in Legend of the Greasepole are also based on the IntelliFrosh behavioral system. The crowd of purpled Frecs is an example of another complicated behavioral system implemented with IntelliFrosh. There are three "sections" of crowd visible during the game. Each section keeps track of their internal characteristic attrExcitement, as well as several metrics that are used to determine how they react to the action around them. An example of one such metric is the number of frosh currently at each level of the human pyramid. 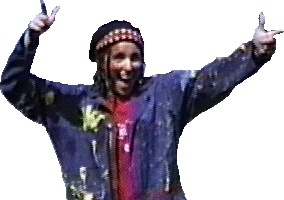 All other sprites in the game have access to a global "energy pump" that can be used to infuse the crowd with energy. The energy in the crowd slowly declines as a function of time, such that the only way to keep a crowd cheering is to continually pump energy into them. The resulting energy system is very dynamic, and heavily sensitive to feedback. For example, an increase in energy may induce the act of cheering, which in turn will cause an increase in the rate at which energy is released. Once sufficient energy has been released, the crowd ceases to cheer and returns to milling around. faMilling Milling about and watching the action. Occurs when the crowd has minimal energy and there is no action in the greasepit. faCheering Cheering and waving their leather jackets. When the crowd energy level rises above the constant energyCheer, this action is triggered. faSlamming Cheering and slamming their leather jackets on the ground in unison. When the energy level rises above the constant energySlam, this action is triggered. Causes a massive release of energy. faBooing Taunting the frosh. Occurs when energy level is above energyCheer and there are very few frosh above the first level of the pyramid. faBlocking Blocking an apple toss with their leather jackets. Occurs if the player throws an apple at the crowd. Detrimental to the players attempt to obtain their iron ring, and saps energy from the crowd. faShouting Shouting at the frosh to encourage them. Occurs when energy level is above energyCheer and there are many frosh above the first level of the pyramid. faLookUp Looking up at the Tam. Will be triggered if faMilling is active and there is a frosh at the Tam. faLookULR Look up and to the right. 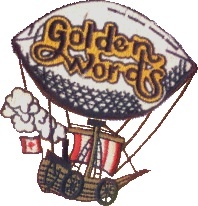 Part of a "Golden Words Balloon" fly-by routine. faLookURL Look up and to the left. Part of a "Golden Words Balloon" fly-by routine. faWave Do "the wave" with leather jackets. Triggered randomly and is passed through the crowd. faPart Parting to allow Al "Pop Boy" Burchell through. Every other object in the game  even the menu bars and the mouse cursor  are controlled by behaviors implemented with IntelliFrosh. The following enumeration of the sprites in the game provides some context as to the abundance of sprites that have been implemented with IntelliFrosh. Over 35 sprites are available for the game to display during gameplay. Figure 11 displays an image showcasing a number of these sprites. The players hand at the front of the screen is encapsulated in the sprARM sprite. The pop-up Arts and Commerce students (like this female Commerce student, sprCOMMIEF, shown here) are encapsulated in their own sprites as well. The president of the Engineering Society (the guy standing on the podium at the left) is controlled by a set of IntelliFrosh behaviors running under the sprite sprPREZ. Of course, each frosh is controlled by an instance of sprFROSH. The crowd consists of three sprites: two instances of sprFRECGROUP, and one instance of sprFRECACTION. The menu screens are also displayed and controlled by a group of over 30 IntelliFrosh sprites. The "discipline selection" screen showcases how IntelliFrosh facilitated rapid development. Each of the discipline bars shown in figure 12 are instances of their own IntelliFrosh sprites, sprmnuBAR1 through sprmnuBAR20. Each make use of the same action function, but they are initialized to their own sets of internal characteristics. 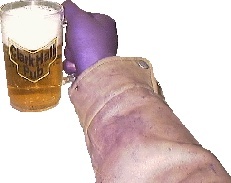 The resulting sprites are able to cue up different wave files and return to unique locations on the screen, but are also each capable to being dragged onto the arm of the (purpled) leather jacket. GameLoop, A Windows event-driven GameLoop class. Mouse, A mouse handling class. SpriteSet, a container class that implemented parallax scrolling between layers of sprites. TSprite, the class which housed IntelliFrosh. Layer, part of the layering system used for SpriteSet. A system for managing bitmaps and wave files. The AutoRun utility which runs when the CD is placed in the drive. Also developed using Visual Studio and written in C++. Coding for the InstallShield installation that automates The Pole Games installation onto an end-users machine. Written using InstallShield Express 2 by InstallShield Software Corporation. The majority of the artwork found in the Pole Game was created by modifying digital images taken at Greasepole 97. These shots were taken with a Nikon Coolpix 300 digital camera. The resulting images of mud, lanolin, the pole, the podium and everything else at the pit site were doctored and edited before being included in Legend of the Greasepole. One exception is the crowd; it was filmed with a camcorder prior to the actual Greasepole event. Images frozen from the camcorder stream were of significantly lower quality than the shots taken with the digital camera, but the fast-action shots of jackets being slammed could not be acquired using still-motion methods. Over 30 individuals are listed as the visual cast of Legend of the Greasepole. There are countless others who attended the filming session and remained anonymous. A number of individuals  including Al "Pop Boy" Burchell  worked closely with the Legend of the Greasepole team to carefully digitize images like the players hand and the players jacket. 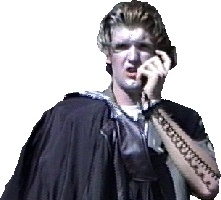 Elizabeth Burke of Sheridan College, a fine arts school in Toronto, Ontario, designed the look of the frosh character for Legend of the Greasepole. She took two months to sketch and animate the character, which she based the character on the stereotype of a "typical" first-year engineering student at Queens University. The frosh each sport a tam, plaid pants, a purple "frosh week" T-shirt and the requisite socks-dangling-from-the-tam to complete the look. 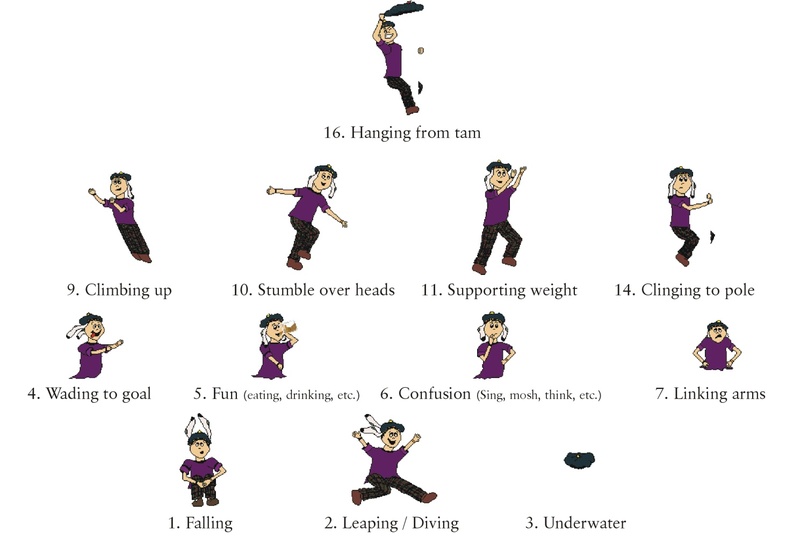 The frosh were first animated on paper performing actions required for the behaviors listed above. Once scanned into the computer, the frosh were colored in and touched up by Kitty Lee, an Applied Science student at Queens. It was important that the frosh appear unisex, and also reflect the multicultural nature of the Queens student community. A great deal of work went into writing code that would take a single skin tone and map it onto several different tones for the game. Three elements of the artwork  the Iron Ring forge, the Iron Ring and the megaphone  were rendered using 3DStudio Max. The Iron Ring Forge is Artistic Director Craig Calverts creation and is rendered entirely in 3D, as is the spinning Iron Ring. The megaphone represents one challenge that was overcome using high-tech methods. No megaphone available was during the digital filming at Greasepole 97. We wanted the Engineering Society President  at that time George Dyke, Applied Science class of 98  to be able to speak through a megaphone at the frosh in the game. George ended up using a milk jug as a stand-in. 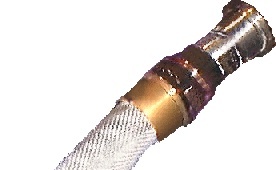 The jug was replaced by a 3D-rendered megaphone for the shots included in the game. The majority of the sound effects heard in the game were recorded on-site at Greasepole 96. A TASCAM digital audio recorder was used to record over 600 megabytes of high-quality sound effects were recorded at the event for use in the game. On October 31st, 1997, a recording session was held at the digital studios of Queens on-campus radio station, CFRC. At that time, the voiceovers that had not been obtained during frosh Week were digitally recorded. See the "Project Management" section below for more details. Goal General description of and motivation for the goal. Category Art, Music, Programming, Web Design, or Other. Duration The amount of time this goal would take to achieve. Resources The resources that would be required to accomplish this task. Ending Milestone A very specific milestone to mark the end of this task. Dependencies Other goals that needed to be met before this one. Planned Completion Date A specific date. Promise Date Date the Planned Completion Date was last updated. Status Current status of this goal. Assigned to Individual responsible for ensuring this goal is reached. The database of goals was shared via the Legend of the Greasepole web site so that all members of the project team had access to the current status of the project. It was also updated regularly in its giant wall-sized form at Legend of the Greasepole Headquarters in Kingston (the authors basement). With so many individuals involved in the project and so much to accomplish within the time frame, the team was very pleased to be completed the two-year project ahead of schedule by four weeks. The CDs were ready in early August, ahead of the September 12th, 1998 target. The team is indebted to Professor David Alex Lamb of Queens University for the documents he provided that detail the planning of a large-scale software engineering project. Regrettably, the time line we developed is not available in Microsoft Project or other project management software and as such is not included with this document. The author regrets not taking pictures of the giant timeline when it was on the wall, as it was pretty cool. Because there had never been a Computer Science club at Queens University before, and because no real channels existing for publicizing the new project, it was very difficult to promote Legend of the Greasepole and get individuals involved in its creation. Included with this document are samples of advertisements that were created during Legend of the Greasepoles development. The Pole Game Compendium was a document written by Robert Burke and officially released Friday August 2, 1996. It included: a project timeline; a description of Legend of the Greasepole and the artificial intelligence tasks that lay ahead; a discussion of potential "tools" that might be implemented as means for the player to stall the frosh; and a list of the sound effects we would need to record the following month during Orientation Week. The document was released on the Queens Applied Science 99 Home Page and distributed around Kingston. During the summer of 1996, Robert Burke worked as Assistant to the Head of the Mathematics and Statistics department at Queens University. He had been asked to arrange a reunion for all 50 years of Math and Engineering graduates at Queens. At the time of the reunion, the first incarnation of IntelliFrosh was functional and the frosh characters in Legend of the Greasepole were capable of a feeble attempt at climbing the Pole. Robert demonstrated the game to the alumni at the reunion, and their response was very positive. Donald Bloor, Science 77, sent the Legend of the Greasepole team an unsolicited donation, with a request that the team reserve him a copy so that he could "indoctrinate [his] members of the classes of Sci 08, Sci 12 and Sci 15." The Halloween Recording Session at Queens CFRC Studios of 1997 was heavily publicized. In early April of 1998, a campaign with the slogan "Relive the Unexplainable" was launched. Full-color glossy advertisements for the game were sent to over 250 alumni, as well as 200 high-tech firms. In late April of 1998, an advertisement was submitted to Golden Words, the campus Engineering publication. It reminded the students that the Pole Game was coming and would be at Queens in September. To quote the LegendWeb (where "we" refers to the Legend of the Greasepole team), "From Day 1, The Legend of the Greasepole team has been committed to a purely legal production. We have purchased every piece of software used in the development of The Pole Game and The LegendWeb and encourage others to do the same. "We have received written and/or verbal permission from each of the [listed] cast members for the use of their likenesses within the Pole Game. The characters being portrayed in the game are fictional, and while the Pole Climb is a real event, none of the events portrayed within The Pole Game actually occurred. The Male ArtSci, Female ArtSci, Male Commie and Female Commie characters were not filmed at the Greasepole and the effect of them falling into the pit was simulated. "The Legend of the Greasepole designers are indebted to the many authors and contributors to the Queen's Engineering Society Web, found at http://engsoc.queensu.ca. The Legend of the Greasepole team made every effort to contact the current webmasters and confirm that it was acceptable to use their material on the CD. 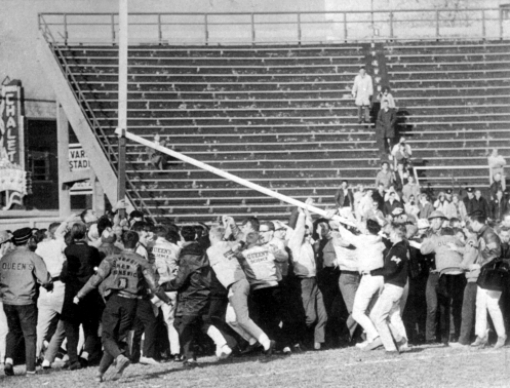 "No frosh were harmed in the production of this game." Due to the innovative (and outlandish) nature of the Legend of the Greasepole project, it was extremely difficult to find financial assistance for the project within the Queens community. The Legend of the Greasepole has always been a non-profit endeavor, and if its developers sell the entire first run, they will just break even. To quote the LegendWeb again, "the rentals of digital audio and video equipment, as well as required upgrades to our computer systems and burning of 1,000 CDs resulted in expenditures of over $8,500. (A more detailed breakdown of expenses is available upon request.) We have been exceedingly careful regarding copyright law (see above), and are proud to know that we have conducted business without pirating any software or intellectual property." Financial support finally came during September of 1998 from the Alma Mater Society of Queens University. Their Special Projects Fund donated over $2,000 to the Legend of the Greasepole team to assist with burning the CDs. The CDs have since been distributed within the Kingston community and are available to students for between $12 and $18. and for his tremendous support. who made us realize this was all possible. The following tools were used to develop Legend of the Greasepole. CD-ROMs were produced by ROMifications of Ottawa, Ontario. The Legend of the Greasepole team received the first run of 1,000 CDs in Kingston on August 12th, 1998. The CD silkscreen, jewelcase liner and booklet were produced using four-color process from graphics originating in CorelDRAW 8.0. This is one of many reports written about Legend of the Greasepole. A variety of technical information about the game can be found in the LegendWeb on the Legend of the Greasepole CD. Current information and new releases of the game can be found online at http://engsoc.queensu.ca/polegame. Burke, Robert C., The Legend of the Greasepole: Artificial Intelligence for Synthetic Characters, (September 1998). 8 slides from presentation given for projects course; available upon request. Burke, Robert C., Legend of the Greasepole Application for Alma Mater Society Special Project Funding, (July 1998). Presented to Alma Mater Society Vice President University Affairs Alison Loat; available upon request. Burke, Robert C., Queens Coat of Arms Trademark Use Request and Explanation, (July, 1998). Presented to Dean of Student Affairs Robert Crawford; available upon request. Burke, Robert C., Mechanical Licensing Update, (June 1998). Available at Credits\License in LegendWeb. Burke, Robert C. and Calvert, Craig C., The Legend of the Greasepole Business Plan, (March 1998). 35 pps. Presented to Dean Harris, Faculty of Applied Science; available upon request. Burke, Robert C., Pole Game DirectX Requirements Analysis, (November 1997). Available at Gallery\Betas\Documents\ in LegendWeb. Burke, Robert C., Pole Game Voice Talent Detailed Descriptions, (October 1997). Available at Gallery\Betas\Documents\ in LegendWeb. Burke, Robert C., The Pole Game Whitepaper Revision 1.0, (September 1997). Available at Gallery\Betas\Documents\ in LegendWeb. Burke, Robert C., Pole Game Graphics Specifications, (February 1997). Available at Gallery\Betas\Documents\ in LegendWeb. Burke, Robert C., The Pole Game Whitepaper Revision 0.2, (March 1997). Burke, Robert C., The Pole Game Whitepaper Revision 0.1, (August 1996). See Section 1.1 of this document.